Hundreds of thousands of babies’ lives could be saved in Uganda each year thanks to a University of Liverpool Professor’s unique invention. 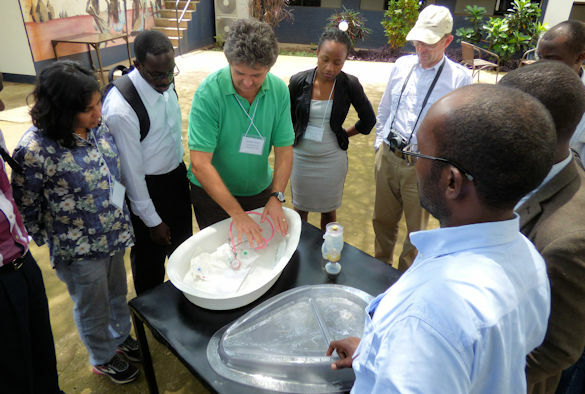 The BabySaver, developed by Professor of International Maternal Health Andrew Weeks from the University’s Institute of Translational Medicine, is a simple plastic unit where babies can be resuscitated without having to separate them from their mothers. It costs less than £40 to produce- a fraction of the cost of traditional resuscitation equipment- and the aim is to ensure they are in place in every hospital in Uganda. The tray, which contains equipment like a suction device and stethoscope, can be placed between a mother’s legs enabling the umbilical cord to remain intact whilst doctors treat her baby, which has important health benefits for the woman and her newborn child. Professor Weeks is also the co-inventor of a similar, but far more complex, device called the LifeStart trolley, which is used in UK hospitals, but these machines can cost as much as $15,000. They also require electricity-something that is often unavailable for the thousands of babies that are born at home in rural areas in Uganda. Professor Weeks, who also works as a consultant obstetrician at Liverpool Women’s NHS Foundation Trust, said: “Each year approximately six million babies across the world require basic neonatal resuscitation and around 900,000 of these will die. The vast majority of deaths occur in low-income settings where there are few facilities for newborn resuscitation at birth. “Where resuscitation does occur, it often happens away from the mother, or even in another room, which can be very distressing for the mother and baby. “The BabySaver enables resuscitation to take place at the bedside, with the umbilical cord still attached. Allowing the cord to stay intact has huge health benefits for newborn babies but it also allows the midwife to stay with the mother at a high risk time for her. Studies of bedside newborn resuscitation carried out in Liverpool have shown that it is preferred by mothers and staff. The product has been developed in conjunction with James Ditai, of the Sanyu Africa Research Institute (SAfRI) in Eastern Uganda, and Peter Watt, a design engineer at the Royal Liverpool and Broadgreen University Hospitals NHS Trust, after trials with staff and patients at the Mbale Regional Referral Hospital (MRRH) in Uganda. The prototypes have been manufactured by a team at the Bryn Y Neuadd Hospital in Gwynedd, Wales. Dr Kathy Burgoine, Head of the Neonatal Unit at MRRH said: “We are delighted to be supporting Prof Weeks and his team with this project. The project has been funded by Grand Challenges Canada, which funds innovative projects in low-income countries across the world, and the Sir Halley Stewart Trust, a grant-giving charity that supports innovative and pioneering social, medical and religious projects. 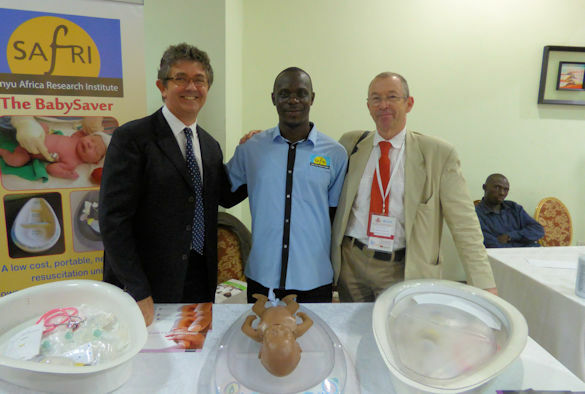 The BabySaver prototype was officially launched in Uganda last month (August) when it was handed over to the World Health Organisation’s Uganda representative Dr Olive Sentumbwe. It has the full backing of the country’s Ministry of Health. Further testing of the product will now take place to refine it. The final version will be manufactured in Uganda and distributed throughout the country. A video about the device can be found here.